SARAH GERONIMO is very much excited with her coming 15th anniversary, ‘This 15 Me’, at the Big Dome on April 14. After that, she will bring it to the U.S.A. for a six-city tour, produced by Rochelle Nubla and Lynn Bautista’s International Concert Management, in cooperation with VIva Artists Agency. “This 15 Me” is an apt celebration of Sarah’s 15th anniversary in show business as one of the country’s most bankable concert artists and box-office draw. In addition, Sarah was recently named Best Philippine Act in the International Golden Panther Music Awards held in New York City. 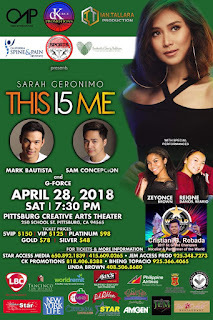 Joining her on stage for the highly-charged “This 15 Me” performances are “Miss Saigon” alumna Mark Bautista and versatile young singer Sam Concepcion. “This 15 Me” starts at the Los Angeles Theater on April 21. It will be followed by shows at the Pala Casino Spa Resort Event Center on April 22; Pittsburg California Theater, April 28; Cannery Casino The Club, Las Vegas, Nevada, April 29; Copernicus Center, Chicago, Illinois, May 4; and Colden Auditorium, New York, May 6. 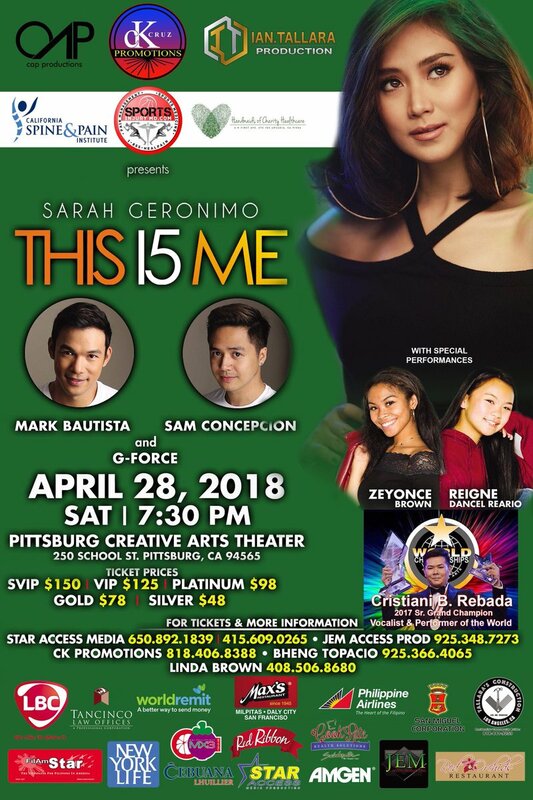 This early, ICM reports that VIP tickets to Sarah’s “This 15 Me” US concert tour are almost sold out while VIP tickets for the Manila leg were wiped out just a few minutes after release. Nubla and Bautista’s ICM, in partnership with Starmedia Entertainment, was the same team behind the equally blockbuster US concerts of big name Pinoy artists Vice Ganda, Regine Velasquez and Ogie Alcasid. Another surefire hit, Sarah’s “This 15 Me” US tour is sponsored by San Miguel Corporation, Amgen, World Remit, Cebuana Lhuillier, Philippine Airlines, Tancinco Law Offices and DMI Philippines MX3. For ticket inquiries and reservations, log on to www.icmanagementinc.com. This proves that rumors that Sarah and Matteo are currently about to split up. allegedly because Matteo is flirting with other girls and Sarah was hurt, are simply not true.